In 1994 I developed and published a program called WEN_GRPH, which accompanied the DOS timewave software. This program is designed to take as input any sequence of I Ching hexagrams which satisfy at least some of the properties of the King Wen Sequence and to reproduce the construction as described by Terence McKenna in The Invisible Landscape, the manual for the DOS software, and in Derivation of the Timewave from the King Wen Sequence of Hexagrams. In particular the WEN_GRPH program will generate the standard set of 384 numbers from the King Wen Sequence itself (with the "half-twist"), as well as the "alternate" set (without). In early November 1997 McKenna announced a "bombshell" on his web site: a claim that mathematician John Sheliak had succeeded in formalizing mathematically, using vector algebra, precisely this construction, so that the 384 numbers could be generated by a single (very complex) mathematical formula. Matthew Watkins had done the same thing, but this time it was claimed that the process of the construction could be expressed from beginning to end in terms of vector algebra. As a by-product of this work it was announced that the set of 384 numbers given in Appendix II in the original edition of The Invisible Landscape had embodied an error, namely, it had incorporated a step for which there was no justification (as Matthew Watkins himself had pointed out quite clearly). 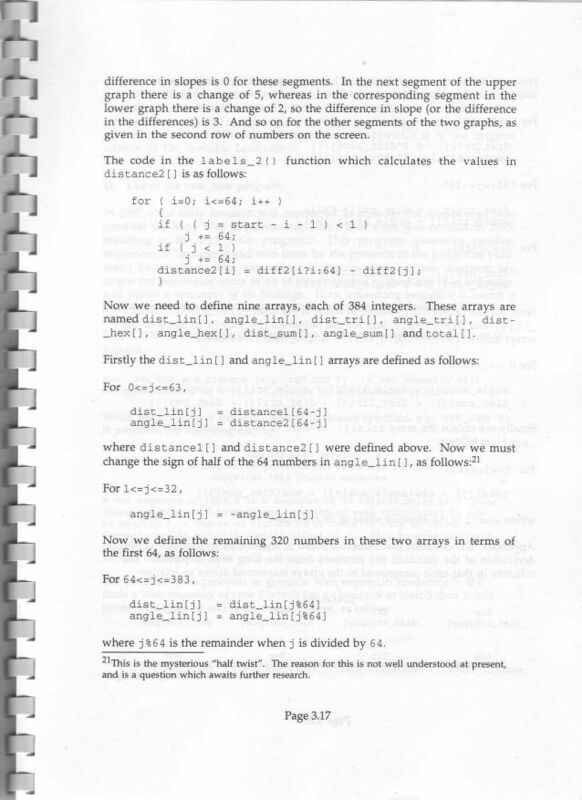 This was the "half-twist", whose existence I had previously revealed in the original version of the documentation (published in 1994) in a footnote in the DOS software manual. 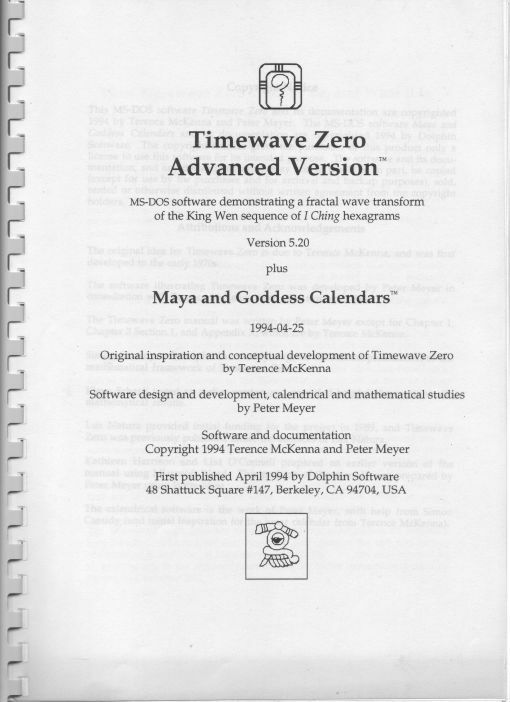 The DOS Timewave Zero software was designed to accept any set of 384 numbers (satisfying certain minimal conditions) and to generate "a" timewave from them, via the process known as "fractal transformation". Thus it would take this "revised" set of numbers as easily as the "standard" or "original" set, and generate a timewave. This timewave, the "revised" timewave, was now said to be the "correct" timewave (and it was claimed that the revised timewave had a much better fit with history). In late November 1997 I received indirectly from John Sheliak the revised set of numbers, and was asked to check them. I took the occasion to modify the WEN_GRPH program so that it would, upon command, include or exclude the "half-twist" from the construction. So I ran the modified WEN_GRPH program on the King Wen Sequence, with the half-twist excluded from the construction, to generate the "alternate" set of 384 numbers. Since, John Sheliak had claimed, this half-twist had no place in the formalization using vector algebra, it had been discarded. A new set of 384 numbers resulted from Sheliak's work, the Sheliak numbers. These numbers are not the same as the alternate set of 384 numbers, those which result from the omission of the half-twist. Thus the construction formalized by John Sheliak seems to have involved more than the omission of the half-twist [and it is unlikely that his construction is a "correction" of the original construction, except insofar as it is called that — PM, 2010]. More about the various sets of 384 numbers which can be used to generate a timewave will be said in the section below entitled "The Kelley, Watkins, Sheliak and Huang Ti Numbers". The rest of this article is available on the CD-ROM and USB flash drive.